These two are waiting for a parade on Napoleon or just enjoying the Neutral Ground? Only in NOLA! The babies and I will be arriving at 10:30ish and head over to City Park at 11:30ish/12ish. Can't wait to see all of our friends. This thing needs to go... it freaks me out every time I walk by! Saturday cartoons with Sawyer... best day EVER! Our Mommy is in the hospital... Send good vibes for us. We hate this part of our job. In 2008 we had the privilege of meeting this sweet baby and we have taken care of almost weekly for this long. Sadly, they are moving and it is breaking our heart. How do you say goodbye? For the last 22 minutes... Oy vey! $15 (CASH ONLY) for a dog or cat rabies vaccination, tag and license. Lets just lay out all day... shall we! That was a ton of hard work! You gotta stop and smell the flowers! Mark Twain once said, "Age is an issue of mind over matter. If you don't mind, it doesn't matter." And I couldn't agree more. You may be looking at me thinking that my age and senior status is a little more than you bargained for. Well think again! Just think about all those little pesky puppy things you don't have to worry about. For one, I'm not as young as I used to be, which roughly translates into "I'm not as obnoxious as I used to be." 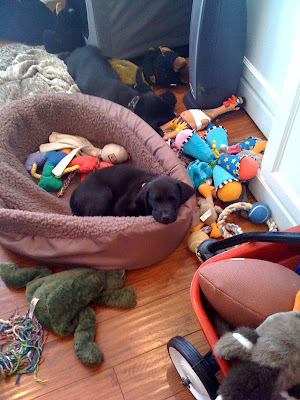 Okay, that sounds harsh, but would you describe raising a puppy as "easy?" Ask any staff member here, and they will tell you the brutal truth. Puppies are a ton of work! Now check me out; I'm a dog who has lived. Chances are I have lots of life experience that makes me a well rounded dog. I've met lots of people in my life. Most likely I've experienced love, and I know how to give it back. I've experienced disappointment and heartbreak. After all, I'm at the shelter, and I had to get here through one path or another. Maybe I came here to P.A.W.S when my family could no longer care for me, maybe I came here after I was found as a stray,or maybe I spent my whole life working in a puppy mill, but do you care enough to find out more? Please come down to P.A.W.S to meet me today! Give a senior dog a chance. Trust me; there is more to me than meets the eye! This sweet gentle female is up to date on all vaccines, spayed, microchipped and ready to meet her new best friend that will be with her as she ages gracefully. I saw this a few minutes ago and it hit me like a ton of bricks... reminds me of the hours and hours we spent at Lamar Dixon in Gonzales after Katrina trying to match people to pets. It was heartbreaking. Bless these people... as we know, life will never be the same. This woman has been through a 9.0 earthquake, a killer tsunami, a nuclear power plant that is emitting radiation, has nowhere to live, is hungry and cold... and she STILL HAS HER DOG! 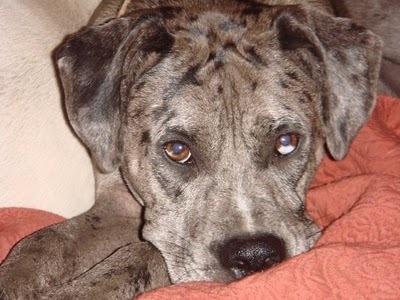 My foster sister (Taylor) is gone! Now - lets play toys! Look at our new babies y'all! Love the street sign wrap in the Garden District! Are you in the CBD? 3rd annual Louisiana Week for the Animals! "Downtown Goes to the Dogs Pet Food and Supply Drive"
1515, 1555, 909, 650 & 400 Poydras. Coco, the full blooded Boston Terrier female needs a forever home. Her owner passed away and she is currently being boarded at a vet's office. She is up to date with shots and spayed. She will be 10 years old this summer. Would make a perfect companion for an elderly person. She is really sweet and loving. She would love to be your shadow! Contact the Madison Ark at themadisonark@gmail.com if you are interested. She loves when her boyfriend Bradley picks her up! Senior Poodle - For adoption - Owner surrender - "we just don't like her"
in your lap the second you sit down. Call shelter 985-651-7387. PS - It is not the two big ones you should worry about! Take a walk if you can...so beautiful! Waiting for Pamela to drop cookies! FIRST ANNIVERSARY CELEBRATION: Can you believe that NOLA City Bark will be 1 year old (or would that be 7 years old?) on March 27? Come join us for a birthday celebration on Sunday March 27 from 9am-2pm! This party is free for all dog park members, both 2-legged and 4-legged. There will be food, birthday cake, drinks, agility, photographs of you and your pooch, obedience demonstrations, and doggie themed music. Veterinarians and behaviorists will be on hand to answer your health & behavior questions. We will be selling NOLA City Bark t-shirts and dog park permits and renewals. Please bring new or gently used towels to donate. We will use them at Shampooch (see upcoming events this newsletter) on April 2 and then wash them and donate them to the LA-SPCA. My babies and I are still going to be going to Dog Day Afternoon and are going to go to City Bark to visit our friends and celebrate the 1st Anniversary. We hope to see you there! If you go out to either... text me! 504.289.6355...would love to see everyone! Day-Of Registration for The Gatsby Strut, our Dog Walk-A-Thon begins. Pamela is so happy Mommy! This sounds like a great workshop and great way to get the public involved in helping abused and neglected animals in Louisiana. Want to help out on the front lines, helping abused and neglected animals in Louisiana? Let the pros teach you the basics, at the Humane Society of Louisiana's upcoming Cruelty Investigations Workshop. We've offered training courses for humane investigators and law enforcement professionals for more than 20 years. HSL is also the state's only licensed 'pet detective' agency; we rely on the services of trained volunteer investigators to respond to and/or assist with animal abuse and neglect complaints statewide. Not sure if you want to become an investigator? Come learn more about what's involved. The course covers information about the state's animal protection laws and their enforcement, which is useful to anyone interested in animal protection. Participants will review the local and state animal cruelty laws and how to use them in aiding animals in distress. Field investigation practices, report writing, crime scene documentation and court room presentation will also be reviewed. The course runs 11-3:30 with a 1 hour break for lunch/networking with likeminded people. Light refreshments only provided. $10 donation appreciated to help cover costs. Monday walkin' is hard... I rest on the weekend! * FIRST ANNIVERSARY CELEBRATION: Can you believe that NOLA City Bark will be 1 year old (or would that be 7 years old?) on March 27? Come join us for a birthday celebration on Sunday March 27 from 9am-2pm! This party is free for all dog park members, both 2-legged and 4-legged. There will be food, birthday cake, drinks, agility, photographs of you and your pooch, obedience demonstrations, and doggie themed music. Veterinarians and behaviorists will be on hand to answer your health & behavior questions. We will be selling NOLA City Bark t-shirts and dog park permits and renewals. * DOG DAY AFTERNOON: Also on Sunday March 27 is the LA-SPCA's Dog Day Afternoon to be held on Roosevelt Mall in City Park just acros the railroad tracks from the dog park. Stop by the dog park for free coffee & pastries and then walk over to Roosevelt Mall and join the walk at 11:00 AM in support of teh shelter. Go to www.la-spca.org and click on events to access the event calendar and learn more about Dog Day and all the LA-SPCA events. 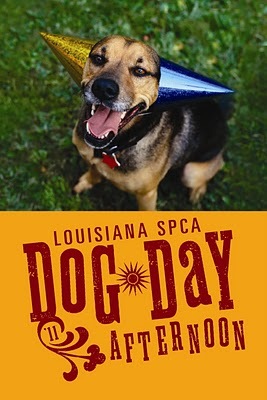 Many of our permit holders have rescue dogs from the LA-SPCA and surrounding shelters and understand the importance of supporting animal welfare organizations-please make an effort to support this important event. NEW SOIL AND TURF FOR HILL: The dog park will be temporarilyclosed all day on Tuesday March 29 and Wednesday March 30 to spread new soil and install turf on the long, bare hill just inside the main gate. This is the time of year to do this so the grass can take advantage of the spring growing season. Volunteers will then fence off that area until the grass has had a chance to establish itself. In the event of rain or other complications, we will let you know by email if this date changes or if the closure needs to be extended. PERMIT RENEWALS: Please visit the websit, www.nolacitybark.org for permit renewal information. NOLA City Bark will host its second 101 Donations fundraiser at the Pavilion of Two Sisters in City Park. This gala event will include food, drinks, live music, and a fantastic auction. Our goal is to raise $60,000 to be used for the installation of lights, irrigation and to repay City Park for funds advanced to complete the dog park. Our adorable Dalmatian wooden cut-out dogs will once again be for sale in April and will be hung on the fence to show that you have supported NOLA City Bark. Please mark your calendar and plan to attend and contribute to this fundraiser. If you would like to help with a committee - auction, food, decorating, etc. - contact us at info@nolacitybark.org. 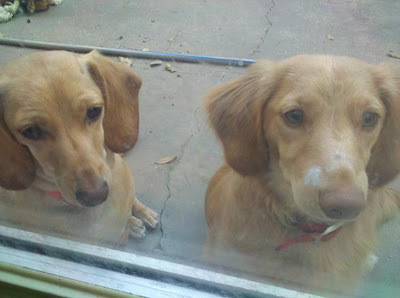 It is my understanding (via a phone message from a Blog reader) that these two sweet babies have found a home! Such great news for Taylor... this one took a long time! Her Foster Mom kept working hard and it finally happened. So happy for everyone - mostly Taylor. She likes when she comes in from her walkin', walkin' walkin! I would not go back to that age if you paid me big money!